can I hand piece batiks? Thread: can I hand piece batiks? I had to fly to europe from US, to see my sick Mom, in a hurry. I took with me partly pieced batik quilt, strips are sewn together, now I have to cut them up and piece again. I do not have sewing machine available here, and I also want to sit by my Mom. My question is, should I continue piecing by hand? I know batiks might be hard to sew by hand but will it look ok, will the stitching be strong enough, and if so, how should I stitch it? try a sample and find out if you like it. it's cotton afterall. Sew it like you would regular quilting fabric. I agree with DebraK - no reason you can't hand sew batiks. Since they are typically a tighter weave, you may want to consider a finer thread. You could then also use a finer needle and it may just make the whole process easier. I think the finer thread would also 'sink' a bit better into the batik as well. The batiks may be kind of dense for hand sewing but a sharp needle and a thimble will be your friend. When hand piecing, I always start and stop my seams with a back stitch and a knot. I keep my stitches to the same length as my machine stitching. I hand piece batiks all the time. No problem, no special thread or needle. I have hand quilted batiks. Batiks are fabric too and use them like you would any other fabric. Prays are with you . They are very long days just sitting and waiting but you get the strength from somewhere. Keep stitching and talking to mum. the batik top is almost done, half of the blocks are hand pieced, the rest are pieced with a machine that I found in my sisters basement, not used for 30 years, got some oil and got it going. Big help to speed piecing. Last night as I was ironing my blocks I have noticed that my hand pieced blocks are better then those stitched by the machine. Have any of you experienced anything like that? I did enjoy hand piecing, though. I will be staying here through August when we have a wedding to attend and the quilt is a gift for the young couple. I am not sure if I can finish this quilt here since I might not be able to find batting. Wondering if I can use flannel or something else. Most fabric stores are gone so it is hard to find sewing tools and materials. 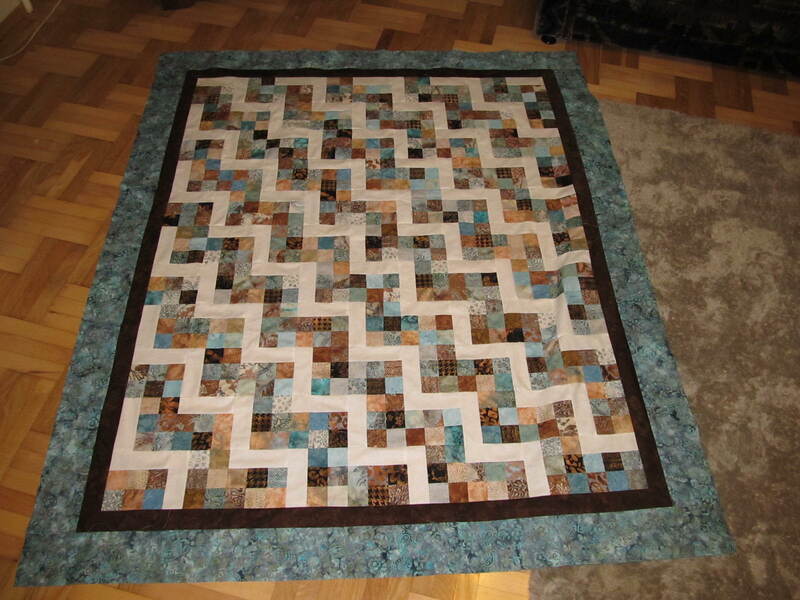 Ok, that is all for now, but I wanted to share my experience with this quilt. Might finish the top tonight, then the borders. I also do not have a matt or rotary cutter, big scissors will have to do. That's why I love to hand piece. I enjoy the speed of machine work, but if I'm not in a rush, hand piecing is the way I go. ((hugs)) Hoping for an outcome that is the best for all concerned. Having something to do with one's hands makes sitting and waiting a bit more bearable. Prayers for your Mom. Hand stitching is a good thing--helps to pass the time and keeps your mind off of worrying. Keep us posted. Thank you Sue, precious times for the family to be together at this time. Each day is different, we know the end is near. She had hard but good life, 96 years old, till 2 weeks ago, quite able. We were blessed. here is my finished top, now I have to find some batting and quilt it. I have started new post because did not know how to attach an image to the old one. Your quilt is lovely. You can use flannel or maybe you can find a woolen blanket, which would make a very nice snuggly quilt. You don't say whether you are hand or machine quilting it. I've been told that wool batting is very easy to quilt.